If you’re looking for the best hot dog made in Kansas, so are we! 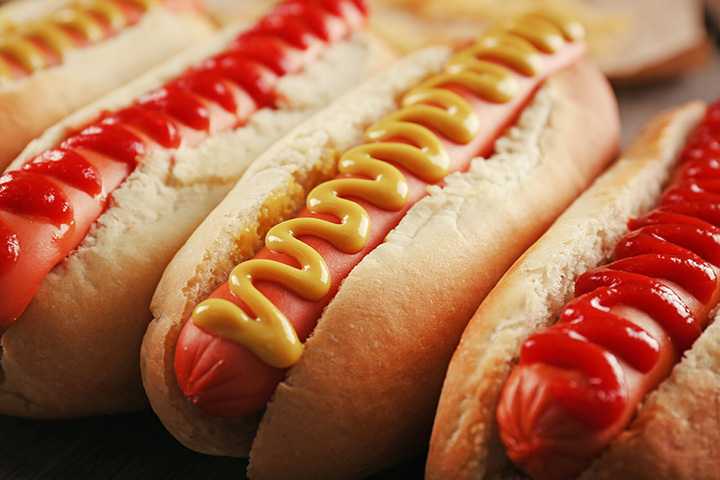 At these great hot dog joints, try a traditionally-grilled or steamed hot dog that might include your favorite add-ons like, mustard, ketchup, onions, relish, cheese, chili, and sauerkraut. A good hot dog will include all the above. Let us know if your favorite spot made the list! Leeway Franks in Lawrence treats their customers to a unique hot dog dining experience. A small selection menu that offers big portions of original Leeway handmade meats from Kansas farms. If you are out and about enjoying your favorite outdoor event and you come across the Rally Dogs food stand of Mt. Hope, stop and enjoy one of their delicious hot dogs. Available throughout the season, Rally Dogs is a must stop to enjoy a yummy hot dog. This long-running Dog-N-Shake restaurant is located at several places in Wichita. A family-owned eatery that provides customers a good place to order a great hot dog, or corn dog, and include a shake for that Dog-N-Shake experience. Order a hot dog from the Wiener Wagon in Kansas City’s Overland Park area and you will find a “Derr Artisan Sausage” wiener wrapped in a home-town bun. This unique wiener wagon’s menu offers breakfast and lunch and a different twist to all its wiener-dogs, artisan sausages and so much more. This year find a great quarter pound hot dog, or hot links, served the way you like it at the Grab’n’Go Hot Dogs food cart operated in Emporia. A simple choice with a great taste, served with chips and a drink. Former Topeka area restaurant owners decided to retire and open a mobile hot dog concession stand offering the finest hot dogs and sausages. This stand offers a variety of hot dogs, plus homemade chili to add to any hot dogs on the menu. Find yourself in the right place, at the right time, and treat yourself to a Hot-2-Trot hot dog in Wichita. Whether you order the quarter pound hot link or the quarter pound hot dog, you are guaranteed a delicious meal. In Overland Park, you can enjoy your favorite artesian hot dog while listening to some incredible music at Rock & Brews Restaurant. A complete menu with specialty hot dogs that you might not find anywhere else. Best of all, you can bring along your pet dog. Who would have ever thought a great “Chicago” style hot dog would be found in a pizza restaurant. Don’t wonder about it anymore, because the Pizza Man serves up good food and a great hot dog, cooked just for you. Would you go the extra mile for an extra-long coney hot dog? If your answer is yes, then get to Longton, Kansas. The two-foot long coney is covered with mustard, onions, peppers, chili, sauerkraut and cheese, very yummy.